Consumers Energy President and CEO John Russell caused a stir last month when he marked the dedication of the utility’s first wind farm near Ludington by declaring that renewable energy is "clean, reliable and affordable for Michigan." Russell’s comments added fuel to the debate over Proposal 3, a proposed constitutional amendment that would require Michigan’s utilities to obtain 25 percent of the electricity they sell from renewable sources — which it identifies as wind, solar, biomass and hydropower — by 2025. 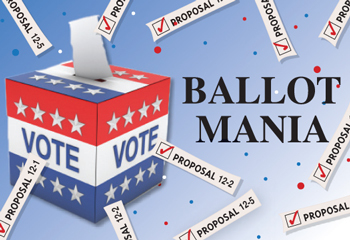 The ballot initiative would limit utilities to rate increases of 1 percent annually to comply with the 25 percent renewable energy mandate. Russell’s comments were curious because Consumers Energy is spending $600 million to build wind farms, while also spending $2.9 million to fight Proposal 3, which would require more renewable energy. Proposal 3 supporters called Russell’s comments hypocritical. Consumers Energy spokesman Jeff Holyfield said the Jackson-based utility supports renewable energy, but noted the Michigan Constitution directs the Legislature to handle energy policy. He said a 2008 law requiring Michigan to obtain 10 percent of its energy from renewables by 2015 should run its course before any changes are made. "Michigan already has a renewable energy standard," Holyfield said. "We think that standard is reasonable and affordable." A recent state report said most utilities would meet the 2015 clean energy mandate. The flap over Russell’s comments highlighted fundamental disagreements over how much of Michigan’s energy should come from renewable sources, how quickly the state should transition to cleaner sources of energy and who should make those decisions — voters directly or through the Legislature. The 25 percent renewable energy standard contained in Proposal 3 would give Michigan one of the nation’s most aggressive clean energy mandates. Eleven other states have renewable energy mandates of 25 percent or higher. Tom Lyon, a professor of business economics and natural resources at the University of Michigan, said Proposal 3 is a reasonable and affordable way to increase the use of renewable energy. "I think the state could ramp up to 25 percent renewable energy by 2025 … and there would only be a modest cost increase," Lyon said. Coal has been Michigan’s predominant source of power for the past 50 years, even though there are no coal deposits in the state. Michigan’s utilities get coal from mines in Wyoming, Montana and West Virginia. Michigan has one of the nation’s oldest fleets of power plants; electricity rates here are above the national average and higher than those in surrounding states; and we lag behind other Great Lakes states on renewable energy, according to government data. Among the eight Great Lakes states, only Ohio has less installed wind energy capacity than Michigan. In 2010, Michigan obtained 59 percent of its electricity from coal. The rest came from nuclear power (26 percent), natural gas (11 percent), and renewables (4 percent). Importing coal costs Michigan utilities more than $1.7 billion annually, according to the federal Energy Information Administration. But coal has one major advantage over renewable energy: Reliability. Coal-fired power plants produce electricity around the clock and can meet varying levels of demand. Solar panels only produce energy when there is adequate sunlight and wind turbines produce power about 35 percent to 40 percent of the time, according to industry data. Despite those limitations, a 2012 study by the government’s National Renewable Energy Laboratory concluded that the U.S., with existing technologies, could obtain 80 percent of its electricity from renewable sources by 2050. The study concluded that renewable energy could provide the vast majority of electricity "on an hourly basis in every region of the country." Proposal 3 supporters claim the measure would create thousands of jobs, cut spending on out-of-state coal and reduce air pollution from coal-fired power plants, which has been linked to asthma in humans, global warming and mercury poisoning of fish. Proposal 3 also would require the state’s utilities to generate renewable energy in Michigan. Large utilities like Consumers Energy and DTE Energy, as well as municipally owned utilities and electric co-op, could buy renewable energy from independent energy companies -- as long as it is generated in Michigan, or adjacent areas served by a Michigan utility. Critics counter that a 25 percent renewable energy mandate is extreme, would cost utilities and their ratepayers $12 billion to meet the standard, drive up electric rates and require the construction of as many as 3,100 wind turbines. Proposal 3 also could eat into utilities’ income by reducing the need to build or upgrade coal-fired power plants. Utilities in Michigan earn revenue by building or upgrading facilities and passing those costs, plus a mark-up that can range up to 11 percent, on to ratepayers. Utilities do not generate income on the sale of electricity, per se. The cost of generating electricity or acquiring it from a third-party provider is merely passed on to consumers. Energy policy in the constitution? Several energy and legal experts said they support the renewable energy mandate, but object to having it written into the state constitution. If approved, Proposal 3 would make Michigan the first state to put such a mandate into its constitution. "I think 25 percent (renewable energy by 2025) is achievable, but I prefer that it not be built into the constitution," said Robert Nelson, who served on the Michigan Public Service Commission from 1999 to 2005. "I think that putting it into the constitution is a big mistake; no other state has done that." James Clift, policy director for the Michigan Environmental Council, said it took 10 years to get the Legislature and utilities to agree to a modest 10 percent renewable energy standard. He said placing a 25 percent renewable energy standard in the constitution would create jobs, force stubborn utilities to shift toward cleaner sources of energy, curb energy costs over the long-term and put Michigan among the nation’s leaders in renewable energy. "Michigan’s Constitution isn’t like the federal Constitution — it was designed to be a living document that reflects the values of the people of Michigan," Clift said. "There have been 68 attempts to amend Michigan’s Constitution and 31 have passed since our constitution was adopted in 1963." T. Arnold Boezaart, director of Grand Valley State University’s Michigan Alternative and Renewable Energy Center in Muskegon, said he believes concerns about putting the clean energy mandate in the constitution could be the proposal’s downfall. "Most people I’ve talked to have said that if they didn’t have to deal with the constitutional issue they’d vote for Proposal 3," said Boezaart, who supports the ballot initiative. "I think it’s a particular conundrum for this proposal." Former Gov. William Milliken, the state’s longest serving governor, recently announced his support for Proposal 3. Milliken said the renewable energy standard warranted the "long-term certainty of constitutional protection." By contrast, Michigan Attorney General Bill Schuette and two of his predecessors, Republican Mike Cox and Democrat Frank Kelley, have come out against Proposal 3. "The constitution very clearly is not the place for energy policy," Schuette said. "In fact, the constitution itself calls for the Michigan Legislature to set energy policy – in Article IV, Section 50 – so Michigan voters should be wary of this misguided attempt to do an end run around that wise provision." About the only thing that both sides agree on is this: Legal challenges are likely if voters approve Proposal 3. "Furthermore, it is not clear what recourse the people would pursue in the event of non-compliance (with Proposal 3)," wrote the Citizens Research Council. "The Constitution allows the people, through the courts, to cause a person or governmental entity to cease actions deemed unconstitutional and to force actions if needed to comply with constitutional provisions. Would the courts issue a writ of mandamus to compel an electric utility to generate more energy from renewable sources, to purchase more energy from renewable sources, or sell less energy from non-renewable sources to maintain compliance with the 25 percent standard?" But what would it cost? Much of the raging ad war over Proposal 3 has centered on the cost question, with opponents warning of huge increases for Michigan families and advocates arguing that renewable is becoming the money-saving method to generate power. A recent economic study funded by the Michigan Environmental Council said Proposal 3 would add 50 cents per month to the average residential electric utility bill. That result came after authors calculated renewable contract costs and subtracted savings from a reduced use of carbon-based fuels and power plants. All types of renewable energy now cost less than generating electricity at a new, state of the art coal-fired power plant, according to a February 2012 study by the Michigan Public Service Commission. The average cost of energy from a new wind farm in Michigan was $91 per megawatt hour (MWh) in 2011, with newer contracts as low as $64 per MWh. The cost of electricity from a new coal-fired power plant is $133 per MWh, or 32 percent higher than the average cost of wind power, according to the PSC study. "The cost of all renewable technologies is less than coal," according to the MPSC, a state agency that regulates utilities. "The weighted average price of renewable energy contracts … is substantially lower than the cost of new coal-fired power plants." Nelson, the former PSC member who is opposing Prop 3, argues that the contract figures used in the MEC report might not reflect true market costs due to a provision of federal law. The "production tax credit" for wind power will expire at the end of the year, if action is not taken. Nelson said wind farm owners in Michigan have been more favorable in their contract terms recently to ensure they could get their federal tax credits. A study paid for by opponents of Proposal 3 says renewable power is much more expensive than traditional sources right now. Both sides' analyses are based on a variety of -- and differing -- economic assumptions. That means voters will enter the voting booth with no definitive answer on what this proposal will ultimately cost. Jeff Alexander is owner of J. Alexander Communications LLC and the author of "Pandora's Locks: The Opening of the Great Lakes - St. Lawrence Seaway." He’s a former staff writer for the Muskegon Chronicle. WHAT VOTERS WILL DECIDE: If you vote for Proposal 3, it is effectively a vote for a huge investment in renewable energy in Michigan, principally wind power. If you vote against Proposal 3, effectively you are supporting the status quo on energy policy, with decisions made by the Legislature and governor. WHAT THE ADS SAY: Proponents of Proposal 3 have used ads to argue that renewable power is healthier and cheaper than carbon-based sources and a job-creator for the state. Opponents of Proposal 3 have used ads to argue that Proposal 3 will impose huge costs on ratepayers and be a radical departure in the legal handling of energy policy. WHAT THE TRUTH SQUAD SAYS: Reports by the Michigan Truth Squad have found that ads favoring Proposal 3 have been generally fair, but misleading in one key respect: how many jobs the mandate would create. The Truth Squad found that ads opposing Proposal 3 have been misleading on several points, such as the actual cost to consumers, the cost to construct the generating capacity and the lifespan of a modern wind turbine. 3 questions 1. What happens to a DTE for example if they fail to achieve the 25% 2. Are wind, solar, biomass and hydro the only renewables allowed 3. Is wind really renewable?